Sometimes the quick décor fixes are the easiest and most cost effective, and to breathe new life into your sofa some new cushions may be the way to go. There is nothing more fun than creating new looks with your decor with simple and quick swaps and changes. Now, we all know that it’s not about changing our furniture every season! Rather, it’s about bringing in some new prints and patterns and introducing a splash of seasonal colours to bring your space into the now. A straightforward and stylish way of doing this is by updating your cushions, and Le Marc’s newest range of cushions have a fantastic variety of colours and designs that will help you create the look you want in no time! For me, Summer is all about the colour green. Flick through any interiors magazine and you will see that interior greenery is all the rage right now, like fiddle leaf plants or syngonium podophyllum pixie. It makes total sense to bring different shades of green into your decor for a fresh summer feel – certainly reflective of our Australian summers. Green is such a versatile colour that matches back to so many other colours, but I especially love it when paired back with clean neutrals and (dare I say) beige tones. 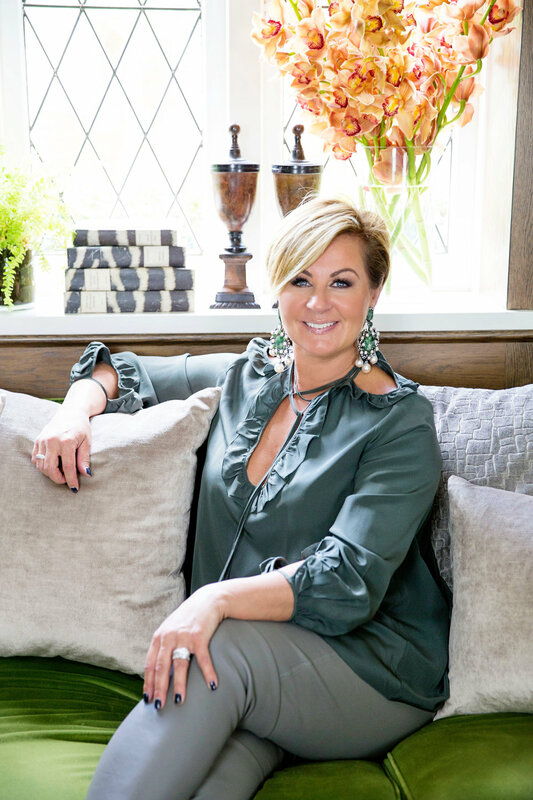 All I did to achieve a green summer look was add a selection of green cushions, picking up on the latest trend of indoor greenery, and match them in with some basics. In particular, I used Le Marc’s Panama Crocodile print cushions as my statement cushion (the green leaf print works so well) and the Patrón Mist, and then adding gentler beige tones like Amsterdam Flint and Mink cushions to compliment the bolder cushions, but which also speak to my dark wood-panelled walls. By decorating the room with indoor plants it compliments and strengthens the overall look. What do you think? I love the sophistication that velvet brings. These neutral tones that are almost bronzed are just beautiful. The cushions I have used are the Zambia Fawn for a playful animal print, as well as the Mosaic Biscuit and the Aedificium Olifant. The palette remains quite natural but bringing in the lush fabrics really lifts this look into one of pure sophistication. Don’t be scared to mix tones and textures - have more than you need to layer up because you can always take it away if it’s looking too busy for your like. You know I am all about more is more is more! My first tip for revamping your sofa is that you don't need to go wild; there is nothing wrong with sticking with your current colour palette and adding one new colour tone to update the look. It can honesty be that easy! What you don’t want to do is take on too many colours and try to make it all work – it will become too busy and an eye sore! Keep it simple and limit your colours choices to a palette you’d be happy to live with every day. When changing your cushions, I think you always need to be mindful of the colours already in your room and to add colours that will compliment or heighten the existing look. For instance, if your living space is white and blue with warm wood tones, stick with it. Look for different shades of blue and navy to mix in with your existing décor – it will make the other shades of blue and navy in the room really pop and everything will be in harmony. You can add a statement colour here and there to your sofa, but don’t go nuts, otherwise everything will become a visual mess! Mixing and matching cushions that feature prints and patterns that fall within the same colour scheme, or even introducing different textures, will add more flair to your look. Be mindful to also choose cushions of varying sizes too – it will add depth to your sofa. At the end of the day, your home needs to be full of what you love. As such, choose décor that is completely you, don’t be lead by trends. If you just abide by some simple styling principles when updating your soft furnishings, you will be able to achieve some fantastic looks! Visit Le Marc or find your nearest stockist to explore their entire range of new cushions hand made in Melbourne, Australia from the highest quality European fabrics and premium full feather inserts. This article is sponsored by Le Marc.